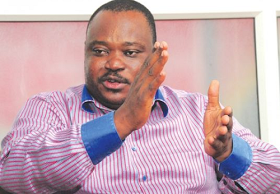 Business mogul, Jimoh Ibrahim today obtained the Peoples Democratic Party, PDP, nomination form to vie for the governorship seat of Ondo State. He was the first aspirant to pick the form from the factional National Chairman of the party, Sen. Ali Modu Sheriff. Speaking at the occasion, Jimoh promised to pay the salary of workers in the state within his first 100 days in office. He described governors who owe workers salary as people without initiative, adding that Ondo State has over 10 solid minerals which he would tap to develop the state.